↑ Amos, Jonathan. 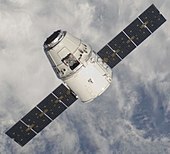 Station grabs SpaceX Dragon ship (англ. ), bbc.com (25 May 2012). Проверено 7 апреля 2015.